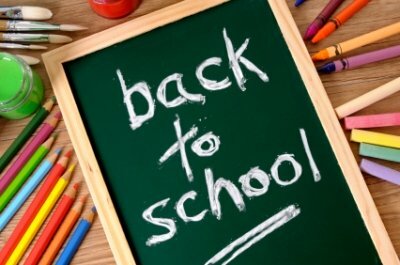 Welcome to my Back to School English Teaching Resources page. Are you looking for fun reading and creative writing activities to use at the beginning of the school year? 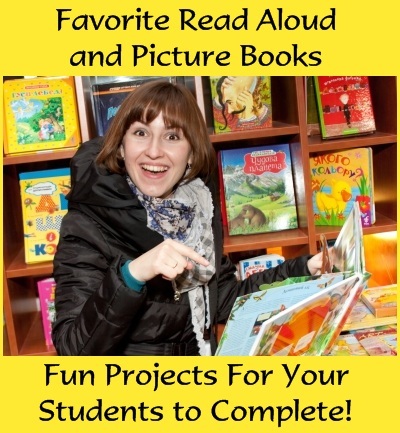 On this page, you will find lists of read aloud books that are great to use at the beginning of the year, unique creative writing templates, reading sticker charts, and fun poetry activities. 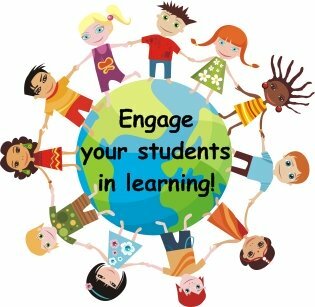 You can use the creative ideas that are on this page to help you plan engaging language arts activities for your students to complete during the first week of school. 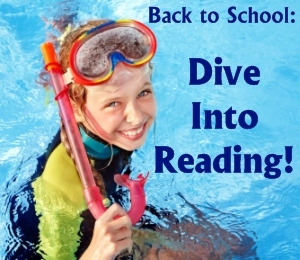 The beginning of the school year is the perfect time to have your students DIVE into reading! My students are encouraged to read with unique reading sticker charts that are designed especially to encourage and promote reading. Start off the new year by providing your students with fun creative writing activities that will make them DIVE into writing with enthusiasm! 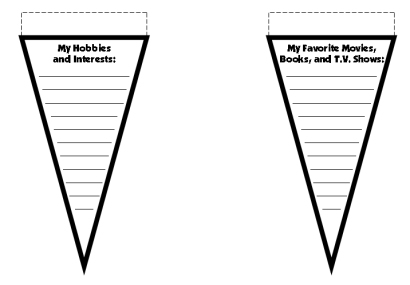 For creative writing assignments, when I give my students unique and fun templates to write on, I have found that they tend to use their best effort on these assignments. When my students are engaged, on task, and using their best effort, they are more careful to not make careless spelling, grammar, and punctuation errors. 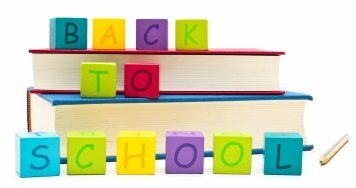 I hope that you will find some creative ideas to use with your own students at the beginning of the year with the Back to School English teaching resources that are found on this page. that I have created for these popular picture books. 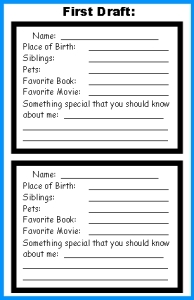 At the beginning of the school year teachers often get to know their students through an information worksheet that students fill out about themselves. These student information sheets are often ideal for a first bulletin board or classroom display for the new school year. 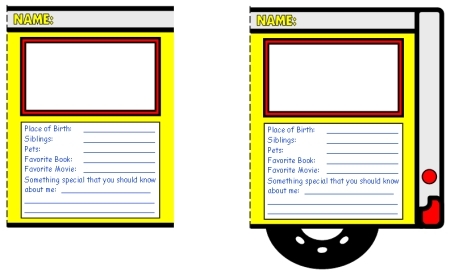 If you are looking for a new, unique, fun, and eye-catching idea for this "get to know me" creative writing activity, take a look at my version of this lesson plan that uses school bus templates. 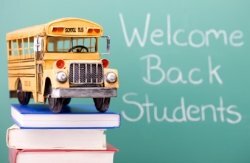 This Student Information School Bus set of lesson plans will provide you with all of the teaching resources that you need for your students to fill out an introductory worksheet about themselves during the first week of school. This fun back to school creative writing activity will help you to be able design a colorful bulletin board display of your students' work. Since this is a short creative writing assignment, your students can complete this task quickly and you will be able to display samples of your students' work in your classroom by the end of the first or second day of school! This Back to School English teaching resources set is designed to be assembled into one VERY LONG school bus. 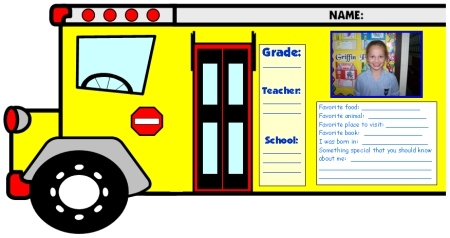 If you do not have the space for a long school bus display in your classroom, you can assemble these templates into groups of 5 students together and have 5 or 6 smaller school buses representing all of your students' information sheets together. Remember, you can make your school bus display as long as you want by gluing as many student bus templates together as you wish. Each student fills in their information section and draws and colors a picture of himself or herself in the bus windows. 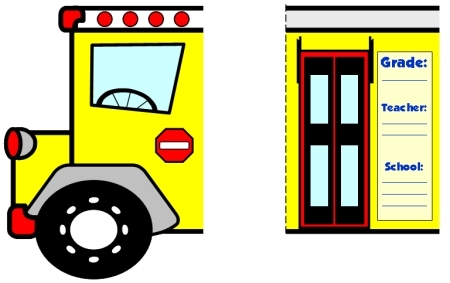 Above is an example of how these school bus templates are assembled together. 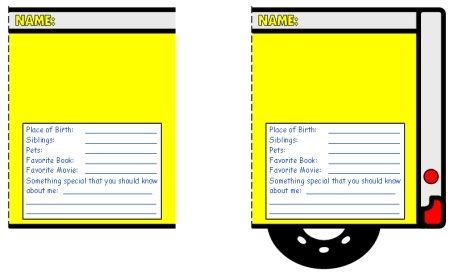 This example shows how 5 student worksheets (plus the front of bus and door templates) are glued together. 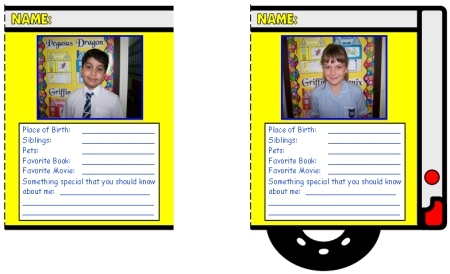 Instead of drawing pictures, you can glue pictures of your students on the templates. if you want to glue student photographs in the bus windows. tips on how to assemble the school bus templates together. Although this is a fairly short writing activity, I still have my students complete a first draft. By taking the time to write a first draft, I can ensure that my students' final drafts contain less spelling and capitalization errors. As my students are filling out their first drafts, I walk around the classroom and read their responses and make comments about the interesting information that I have learned about my new students. When a student has finished his first draft, he raises his hand, and I go over and quickly glance at his work and point out the mistakes that I feel that he should edit and revise. Then, I give this student his final draft bus template. 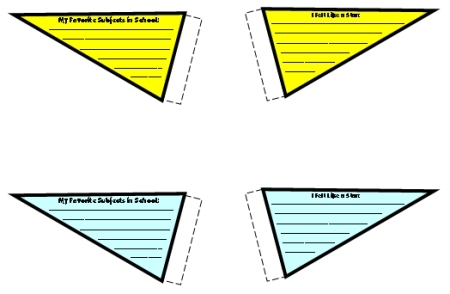 Below is an example of the first draft worksheet, which should be cut into two rectangles and given to two students. Since this set of teaching resources uses the word favorite in it, there is a second set of resources which contains the spelling favourite for teachers in countries that use this spelling. 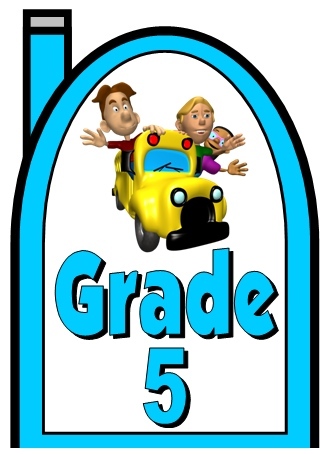 Above: There are two bus templates that are not given to the students: the front of the bus and the door. On the door template, you will write the grade level, your name, and the name of your school. Above: Students draw and color a picture inside the school bus windows. 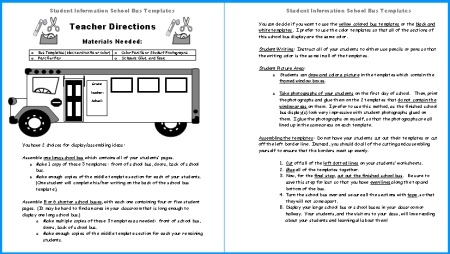 Above: The third bus template (shown on the left) is the template that you will need to make multiple copies of to give to your students. The fourth bus template (shown on the right) will completed by one student. 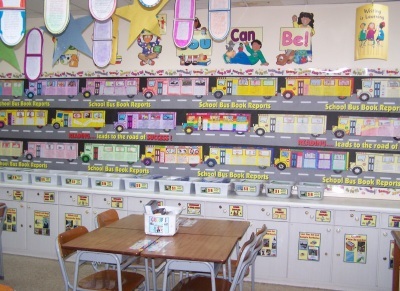 Above: With these bus templates, glue photographs of your students in the window areas. Above: Example of bus templates with student photographs glued in the window areas. 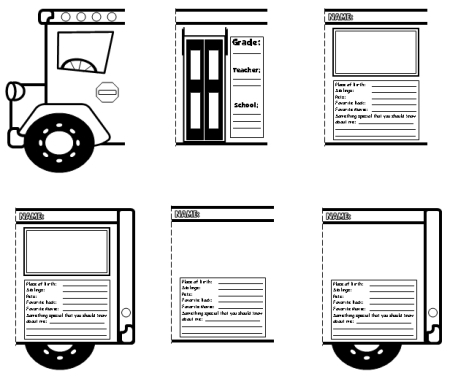 Above: Examples of black and white bus templates. 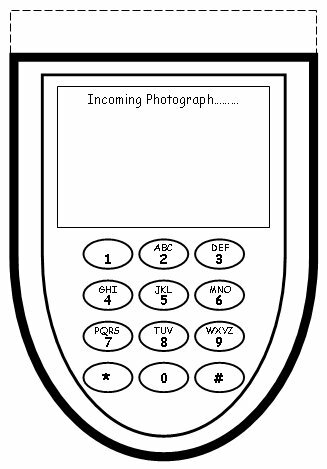 Above: If you are unable to print out color copies of this project, there are black and white school bus templates included in this set. 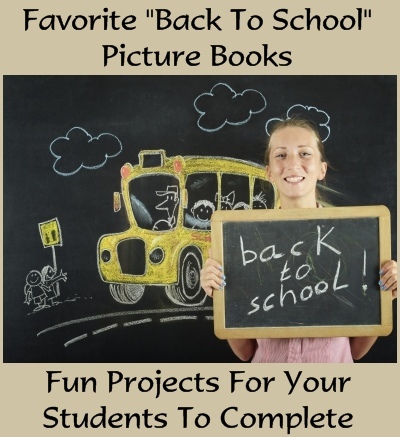 Above: This Back To School English teaching resources set includes 12 pages of road signs which you can use as bulletin board accent pieces to help you in decorating your bulletin board display of your students' work. Above: This set includes a 5 page road banner that you can assemble together and use for your bulletin board display if you wish. 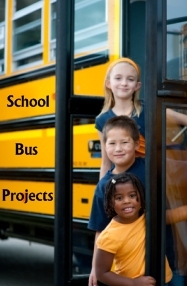 Above: I do not have a photograph example of this finished school bus project. Above is an example of my School Bus Book Reports which are very similar (they are shorter in length and contain a different writing component). Hopefully this picture will give you an idea of what a finished bulletin board display using these projects would look like. 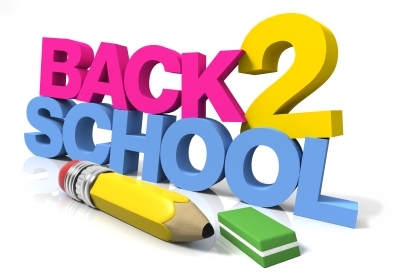 Most teachers like to include a "get to know me" lesson plan activity during the first week of school. Your students probably completed a boring worksheet about this topic with their teacher from last year. 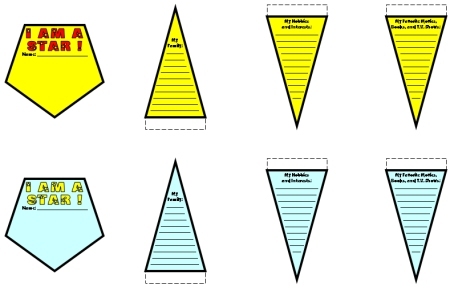 Put a new twist on this assignment by using these star shaped creative writing templates that your students will find unique and fun. 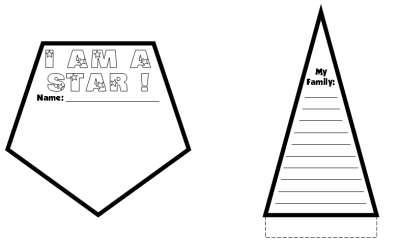 Meet the Stars of Our Classroom is a teaching resources set will engage your students in writing an introduction and description about themselves using fun star shaped templates. 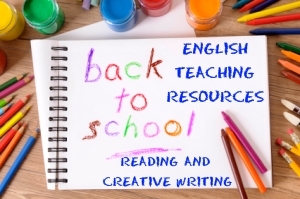 Although I have included these lesson plans on my Back to School English teaching resources page, this creative writing assignment can easily be used anytime of the school year. This star shaped creative writing set contains six templates that are assembled together to form a large star. The finished star project measures 20 inches in width and 20 inches in height. These star projects will make a colorful bulletin board display of your students' work. Everything that you need to complete these projects is included in this set of teaching resources. All that you will need is scissors, glue, tape, and coloring pencils. 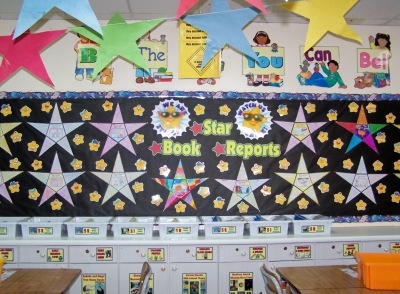 Below is a photograph that shows a bulletin board display using these star templates. 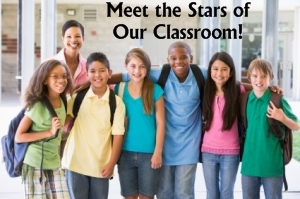 The stars in this photograph are from my star book reports instead of this "Meet the Stars of Our Classroom" set, but both projects are exactly the same size and shape. Below is an example of the first draft writing worksheets that are included in this set of teaching resources. 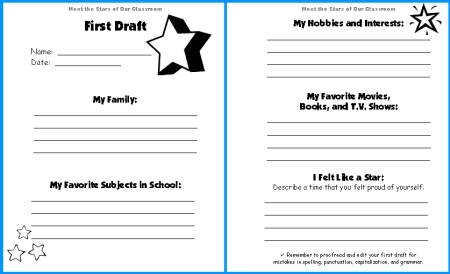 The line spaces on the first draft worksheets match the line spaces on the final draft star templates. In the center of the star template, students draw a picture. This set includes 6 templates that assemble into the shape of a large star. In the center of the star, students can draw a picture of themselves or they can glue a photograph of themselves. the star project measures 20 inches in width and 20 inches in height. 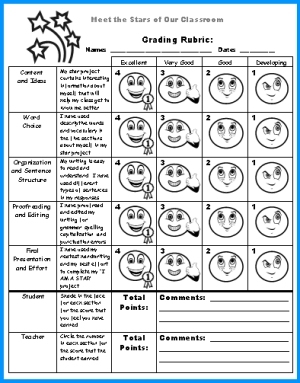 resources set includes a grading rubric. This set also contains color star templates. Below are examples of the yellow and blue templates. Orange, green, and pink templates are also included in this set. 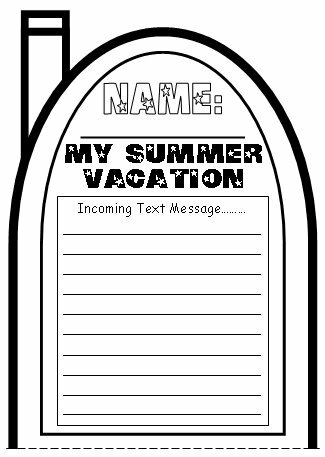 Cell Phone Templates: How many times have students had to write an essay about their summer vacations during Grades 1 - 5? If you choose to use a tradition lesson plan idea for this writing activity, your students will likely be very bored in your class. This is not something that you want your students to feel during the first week that they are in your classroom! 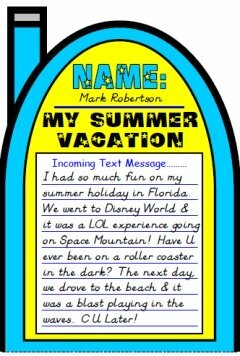 Instead, provide your students with an engaging and fun way for them to write about what they did during their summer vacations with these unique cell phone text message templates. Instead of being bored, your students will go home during the first week of school anxious to tell their parents about a fun project activity that they completed in your class. 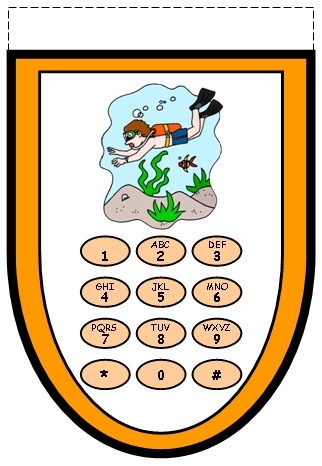 Above: Example of finished My Summer Vacation cell phone templates. Note: In the example above, you will notice text message abbreviations and symbols used in place of words. Normally, I would not allow my students to use these types of abbreviations and symbols in their creative writing assignments, but for this activity, I felt that it was appropriate. 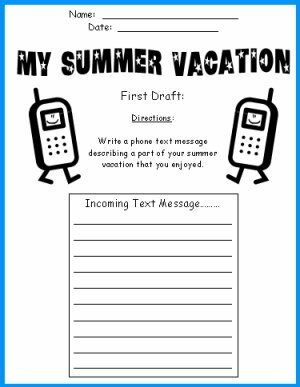 My students really enjoy being able to write their summer vacation text messages using the abbreviations and symbols that they commonly use everyday when they write text messages to their own friends. For some of the abbreviations that my students used, they had to "translate" their messages for me, as I am not up to date on all of the codes and symbols that young people use in text messages these days! 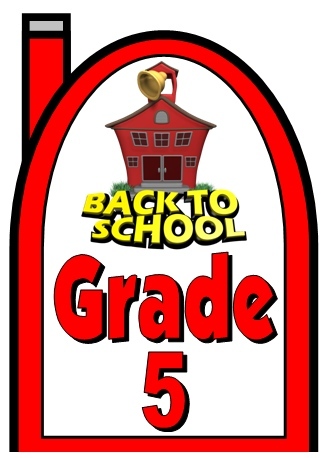 Are you also looking for a unique activity that you can complete the first or second day of school that will provide you with student work samples so that you can create a colorful bulletin board display during the first week of school? This is an ideal Back To School creative writing activity that will not take much time, is easy to assemble, and will provide you with student work samples that you can post on your bulletin board immediately. 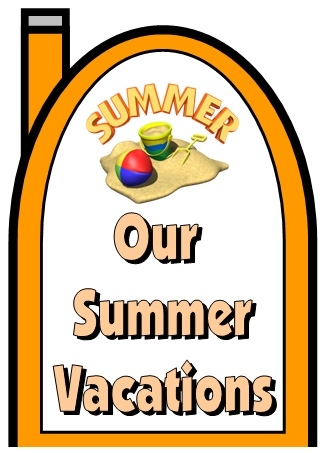 You will be able to quickly design an eye catching bulletin board display featuring your students' work using the bulletin board banner and additional cell phone accent pieces that are included with this set of Back to School English teaching resources. These cell phone templates measure 6 inches in width and 17 inches in height. For this reason, my students never begin their creative writing assignments by writing on their final draft cell phone templates, instead they write on first draft worksheets. Then, they edit and revise their work on their own, with a partner, or in individual writing conferences with me. Below is an example of the first draft writing worksheet that is included in this creative writing teaching resources set. The writing lines and spaces on the first draft worksheet match the lines and spaces on the final draft cell phone templates. 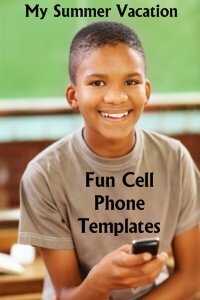 After students have edited and revised their first drafts, you should give them their final draft cell phone templates. There are two templates for students to glue together to assemble their cell phones. 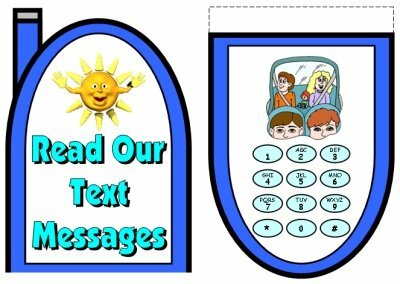 The two cell phone templates have thick borders around them, which makes it easy for students to cut out these templates on their own. black and white cell phone templates. 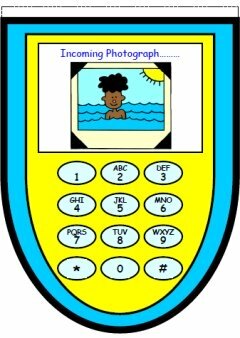 Below: This set of teaching resources includes color phone templates. orange, blue, red, green, pink, and purple. 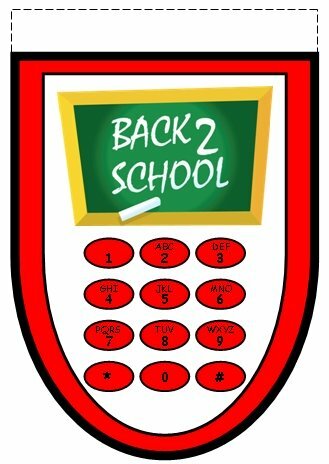 8 cell phone accent pieces in this Back to School English teaching resources set. 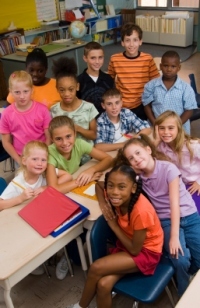 Below: This set of teaching resources includes grade level cell phone accent pieces. 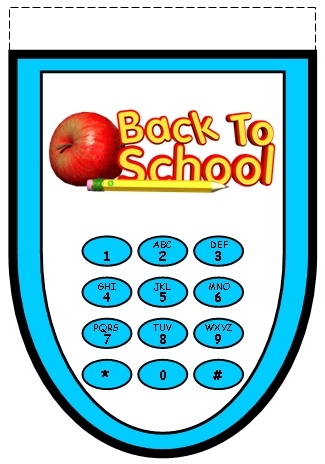 There are 8 separate sets of these cell phone templates for Grades 1 - 8. The Grade 5 examples are shown below. 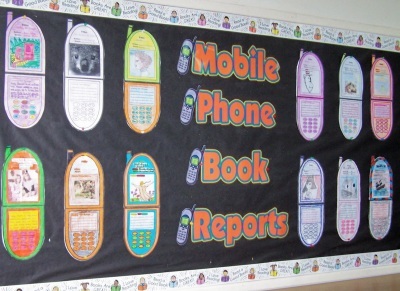 To help give you an idea of what these finished cell phone projects look like, below is a photograph of a bulletin board display using these same cell phone templates. This example is from my cell phone book report projects, so the text area and drawing areas are a bit different than they are in this set of teaching resources. The cell phone templates in this set are exactly the same size and shape as the templates in the photograph below, and they measure 6 inches in width and 17 inches in height. Note: This is Page 1 of my Back To School English Teaching Resources section. 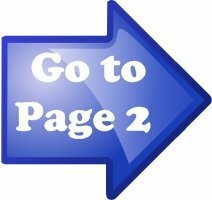 If you haven't visited Page 2 and Page 3 yet, click on one of the underlined links below. 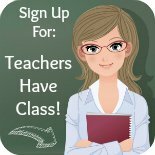 Thank you for visiting my Back To School English Teaching Resources page.